One of the freest and most liberating ways to cruise, commute and travel is on a motorcycle. For the avid motorcyclist, the vehicle holds a unique appeal because of its simple, open-air design. However, the lack of a driver compartment also makes motorcycles far more dangerous than cars, trucks or vans. 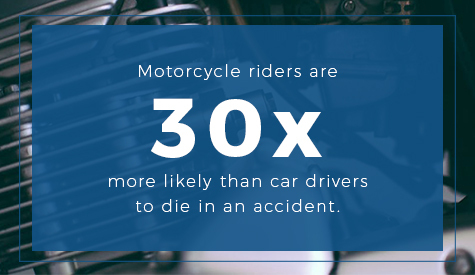 In fact, motorcycle riders are 30 times more likely than car drivers to die in an accident. 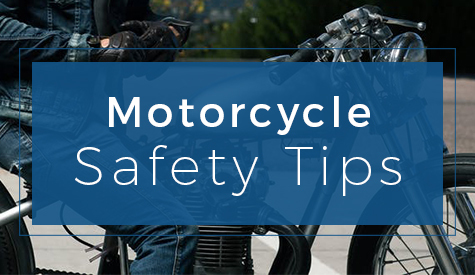 By following safety tips, motorcycle riders can help lower the risk of accidents. When it comes to driving any sort of vehicle, it is important to abide by certain safety practices no matter what type of vehicle you are driving. For instance, excessive speed and intoxication can cause roadside fatalities. Authorities require car drivers to avoid alcohol and obey the speed limit, and these rules are even more important for motorcycle drivers because they are often more exposed to risk and injury. Other various safety concerns matter especially if you make a motorcycle your main means of travel. These safety tips will help new riders choose the right bike and remain safe while riding it. Motorcycles today are built by designers who optimize them for the experienced rider. For starters, the engines on newer bikes are more powerful than ever, even on small displacement models. If you are new to riding motorcycles, you must proceed with caution as you purchase your first bike. One of the biggest mistakes that a new rider can make is to get in over their head by buying a bike more suited to advanced riders. When you buy your first motorcycle, make sure that the bike is the right size. You should be able to straddle it properly. If you are not able to plant both feet on the ground when you sit on the bike, or you have trouble mounting and un–mounting, it means that the bike is too high. You should also be able to reach both handlebars and all the control functions without leaning over. Engines within these ranges allow you to keep up with the general flow of traffic in their respective categories. In any kind of moving vehicle, it is important for the tires to maintain traction with the ground when you activate the brakes. If your tires lose traction, they could skid and send the vehicle out of control. This is especially important on motorcycles, where the rider is much more physically vulnerable to his or her surroundings in the event of an accident. Because of this, most motorcycles today are built with anti-lock brakes, which allow tires to maintain traction when you activate the brakes. When you consider all the ways a motorcycle can spin out of control, in driving conditions where rain, ice or other obstructions are present, it is easy to see why anti-lock brakes are an invaluable safety feature. 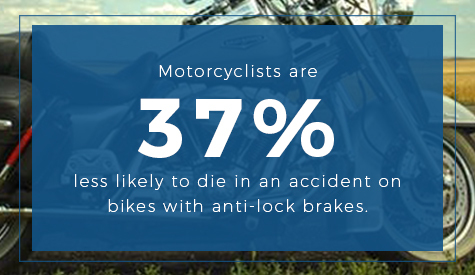 In fact, motorcyclists are 37 percent less likely to die in an accident on bikes with anti-lock brakes, according to data compiled by the IIHS. In situations where a motorcyclist has to make an abrupt stop, anti-lock brakes can prevent the bike from skidding and crashing. If your motorcycle does not have these, getting them installed is imperative. Priced at only a few hundred dollars, it is easily worth it. Before you head out onto the road on a motorcycle, it is crucial to hone your riding skills. This preparation goes way beyond the balance and comfort you attain when you first learn to ride a bicycle. After all, a motorcycle is not simply a bike with a motor. A motorcycle is a vehicle you ride among cars and trucks on the great open freeways. When you get serious about using a motorcycle as your main means of travel and transportation, your skills will need to exceed anything you might have learned as a kid on a bicycle or mini-motorcycle. To attain the skills needed for defensive motorcycling in all riding conditions, take a riding course from the Motorcycle Safety Foundation (MSF). With at least 2,700 locations throughout the U.S., the MSF offers convenient classes on basic and advanced motorcycle techniques as well as how to handle emergency scenarios. The cost for one of these classes is generally no more than $350 and some are even free. Once you have passed an MSF-approved safety course, you might qualify for an insurance discount in certain states. Motorcyclists must contend with flying debris and, unfortunately, the occasional wipeout when they head out on their bikes. Since they do not have the protection an enclosed vehicle offers, they must wear clothing that provides this shield for them. Leather is ideal for protecting yourself from the elements because it has the strength to safeguard skin against flying debris and brushes with the pavement. A motorcycling wardrobe should consist of sturdy leather boots, pants, gloves and a leather jacket. It is also important to wear protective eyewear when you ride a motorcycle. Without it, wind, bugs and debris may get in your eyes and impair your vision. In the event of an accident, it will also protect your eyes from shattered glass. You might also consider wearing a helmet, which will help protect your from head injuries if an accident occurs. Some states even require riders to wear one. Visibility is another factor to consider when choosing protective gear. According to many car drivers who have struck motorcycles, the rider was not visible to the driver. These visibility problems are most common after dark. You should mix whites and other bright or reflective colors with your protective leather wardrobe to ensure other drivers can see you when you take to the roads and highways. When it comes to safe driving practices, motorcyclists are generally more responsible than car drivers are. This is largely because there are far more distractions to tempt car drivers. 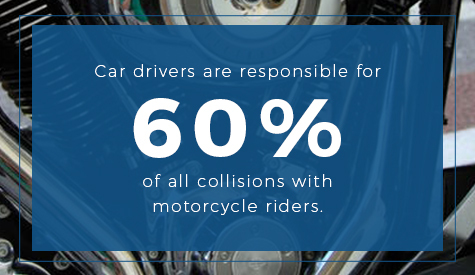 In fact, car drivers are responsible for 60 percent of all collisions with motorcycle riders. Smartphones, in particular, are a common cause of accidents today. A dial tone might sound, causing the driver to reach for the device. During these split seconds of distraction, vehicles sometimes collide. Another grave danger occurs when car drivers use the rearview mirror as a makeup mirror. As a motorcyclist, you do not have these distractions. You do not have the option to text or primp because both hands are needed on the handlebars. Since you cannot predict what the drivers in your midst might do, you need to be alert at all times. You need to be aware of any movements taking place. If a nearby driver abruptly switches lanes or turns onto the road from a side street, proceed with caution. Avoid tailgating in all instances, as this can deprive you of the time you need to stop if an accident occurs up ahead. One of the most problematic conditions for motorcyclists is rain, which poses far more threat to the traction of motorcycles than to cars, trucks or vans. Unlike these other vehicle types — which balance naturally with four wheels under thousands of pounds — motorcycles can easily slide off balance on the slippery surface of a wet road. Rain can affect your vision as well as your balance when on a motorcycle. In times of heavy rain, the downpour can reduce your visibility of the road ahead. The wetness of the road can loosen the traction of your tires and make it difficult to turn at corners and intersections. Rain can be especially dangerous when it first begins, because this is when oils within the ground start to circulate and make surfaces slippery. If you must ride your motorcycle in the rain, be sure not to brake or turn abruptly. Be careful also of the stronger winds that often accompany rain. When riding in wide lanes, veer slightly to the side of the lane that the wind is coming from, as this will give you room in case the push of a wind gust occurs. Another thing to be cautious of is road obstructions, which pose far more danger to motorcycles than to other vehicles. A car can simply straddle many small pieces of road debris. The same does not hold true for motorcycles, which can easily be knocked off balance by small rocks and bottles on the road. In the autumn, leaves and foliage can be dangerous to motorcycle riders as well. While a car can momentarily lose traction over wet leaves, a motorcycle can easily be thrown off balance by a rain–soaked pile of leaves and mud. Stray pebbles and bark dust — which sometimes blows onto streets from around the trees along city roads — can also be dangerous to motorcyclists. Even hazards like bumps and potholes, which often go unnoticed by cars, can be very dangerous to motorcycles. In some cases, the dangers can be hard to spot. Always stay alert and aware of all potential hazards on the roads and freeways. When you see any rocks or leaves along the road ahead, slow your motorcycle down slightly and try to steer clear of the hazards. One of the advantages of motorcycles over cars is that the former is far easier to inspect. So easy, in fact, that you can inspect your motorcycle each time before you hit the road and notice defects the moment they occur. While car trouble could begin anywhere within the motor or under the chassis and could spread to other parts of the car before the trouble becomes apparent, motorcycle problems can be spotted instantly and rectified before any further problems occur. 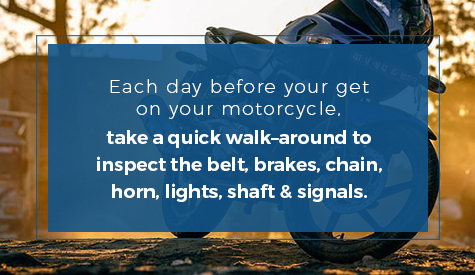 Each day before you put on your helmet and mount your motorcycle, take a quick walk–around to inspect the belt, brakes, chain, horn, lights, shaft and signals. Make sure that each of these parts are working correctly and are free of defects. Check the tires to ensure that the pressure is right, and look for any signs of wear along the rubber. When owners bring their motorcycles into repair shops, the most common problems that mechanics notice are worn brakes and tires with improper air pressure. With improperly inflated tires, stirring and handling become harder to manage. This increases the risk factor of riding. One of the most dangerous things that anyone can do behind a set of wheels is to grow sleepy and continue driving without stopping for a rest. No matter what type of route you are on — a city street, a gravelly back road, an interstate freeway — it is never safe to drive in a state of drowsiness. This holds true for drivers in any vehicle, from trucks and trailers to cars and motorcycles. If you find yourself getting tired in the midst of a long commute, pull over for a rest. It does not matter if it is at a hotel or under a tree at a highway stop. While it can feel a little uncomfortable when you do not at least have the shelter of a passenger compartment, it is simply not worth the risk to drive while drowsy. You certainly do not want to risk blacking out on the road. Besides, it usually only takes a 20-minute nap to feel well rested again. As long as you know how to be a safe motorcycle rider, the experience should be relatively danger free. Sometimes, however, even skilled riders have accidents and suffer injury. If you need representation after a personal injury in Pennsylvania, contact KGB Injury Law for a free consultation.